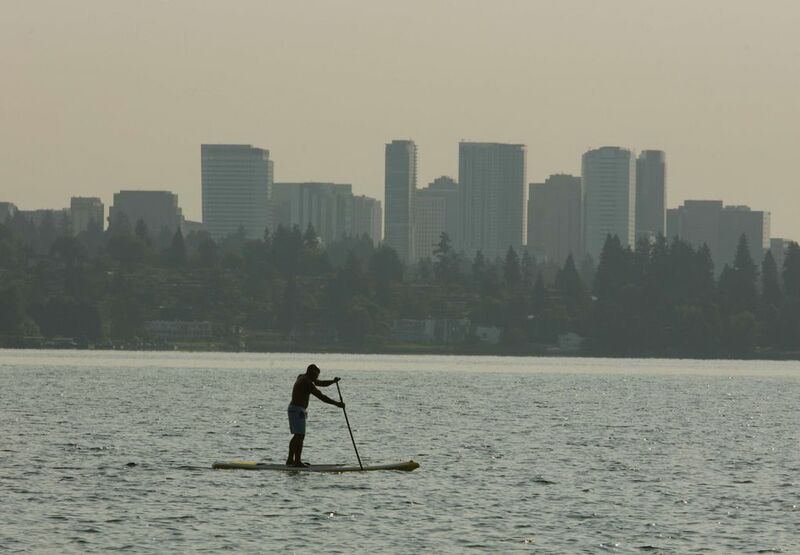 Summer in the Seattle region has been dry, hot, smoky, hazy and ashy. Here are all the records broken, according to the National Weather Service. 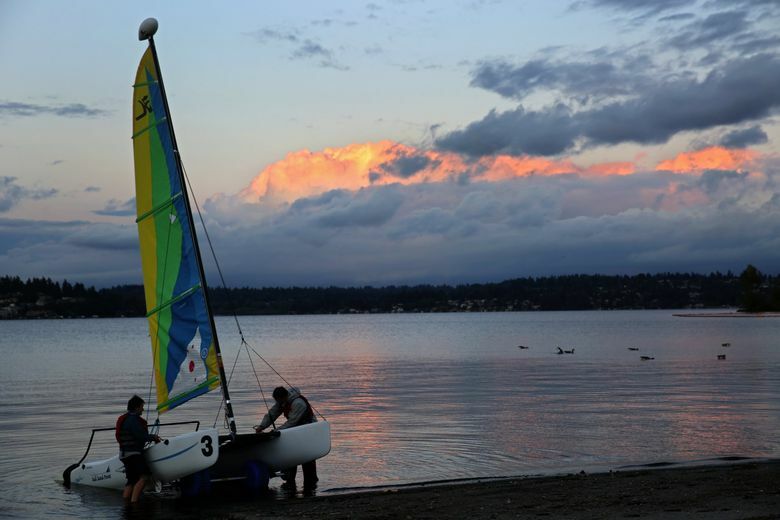 This summer in Seattle was the warmest and driest ever recorded. For those of us living in the Puget Sound region, it might not come as a surprise. 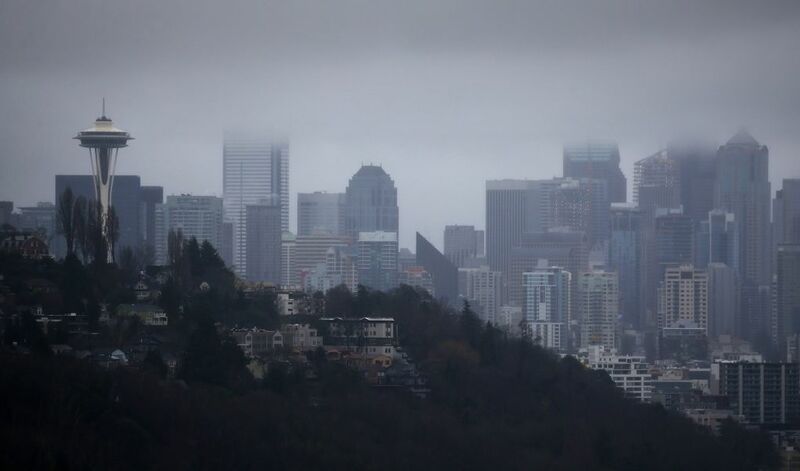 In fact, it’s been a year full of extremes, with numerous daytime high records broken, one of the wettest rainy seasons and some of the haziest, smokiest days in memory from wildfires that blanketed the Pacific Northwest. But this summer was special. 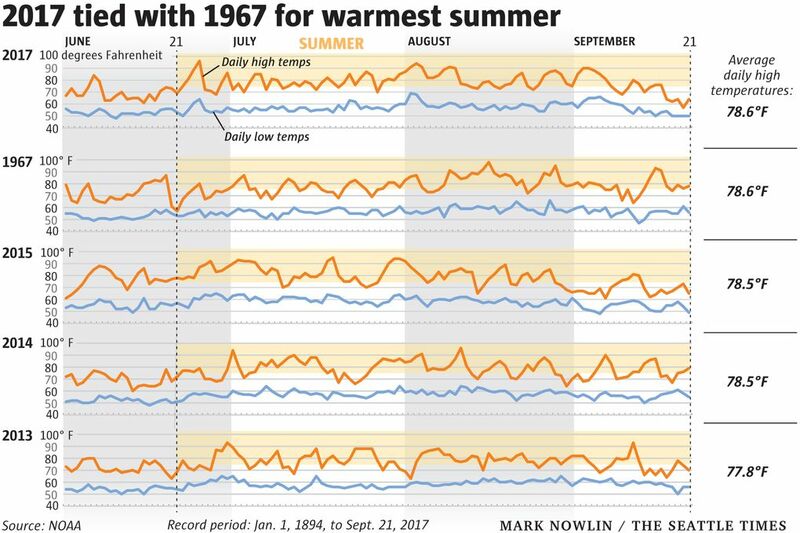 Meteorologist Doug McDonnal, of the National Weather Service in Seattle, said the stretch from June 21 (the first day of summer) to Sept. 21 (the last full day of summer) is going down in the record books as being tied for the hottest since 1894 — when record-keeping began — with an average high temperature of 78.6 degrees, about 4 degrees warmer than average. Tied for first place is 1967, when the average high was also 78.6 degrees, according to the weather service. Early Friday morning, the weather service said 2017 had the hottest summer, but that was amended when the overnight numbers were calculated, McDonnal said. This summer was also the driest on record, according to the weather service, with just 0.52 inches of rain, beating out 1910 at 0.58 inches. The region usually gets 2.25 inches of rain in that three-month period. We were, however, lucky, according to McDonnal: a “good wet winter” left us with a nice, fat snowpack that came in at 120 percent of normal and lasted through the dry season. The “water year,” which runs from Oct. 1 to Sept. 30 (so that the rainy season is not split up), is so far the sixth wettest on record, with 49.30 inches of precipitation. That’s over a foot more than the 36.88 inches recorded in a normal year, McDonnal said. The wettest recorded was in 1997 with 50.85 inches of rain. “That was also the year that Mount Baker set its snowpack record and we had some floods,” he said. This year, as usual, the snowpack was at its thickest in mid-April, gradually melting during the summer. Then the snowpack, it is hoped, builds up again in fall. “We had a really dry, warm summer, but a good winter from a water-supply standpoint and a good snowpack and that’s where we sit,” McDonnal said. The recent rains, which arrived in the last couple of weeks, did a great deal to tamp down wildfires in Washington, Oregon and British Columbia that earlier this month and in August caused smoke, some ash and haze to settle over the Puget Sound area. Three wildfires in Washington were burning as of Thursday: the Jolly Mountain Fire near Cle Elum, which is 40 percent contained; the Norse Peak Fire north of Crystal Mountain, 80 percent contained; and the Diamond Creek Fire, near the Canadian border in Okanogan County, about 65 percent contained. The fire situation should continue to improve if history is any indication. There’s little chance we’ll see many days warmer than 80 degrees in October, said Dana Felton, a weather-service meteorologist. There have been only seven such days recorded, he said. But this weekend should be nice. Saturday is predicted to be sunny in the morning and slightly cloudy in the afternoon, with a high of 65 degrees. Sunday will be sunny with a high of 66, a little below the 69 degree average. In the middle of next week, temperatures will rise again, bringing days in the mid- to upper-70s. “We still have a few days to get out and do stuff,” Felton said. The weather service recently said that temperatures at the equator in the Pacific Ocean indicate that it’s going to be a weak La Niña year, which generally suggests that it will be slightly cooler and wetter than average. These days, Felton said, that seems the safer bet.